Leslie Browne is a real estate transactional attorney whose practice spans a wide range of commercial real estate work. Most recently her practice has focused on public private partnerships; development; and acquisitions and dispositions. Her practice has also included joint ventures, financing and commercial leasing, with an emphasis on ground leases. Her clients include developers, property investors, diverse businesses, and individuals. Her work in the area of public private partnerships has involved representing both private developers and public entities and has included disposition and development agreements, ground leases, construction and permanent financing and complex reciprocal easement agreements. She has worked on many purchase and sale transactions in different property types, including undeveloped land, apartments, office and mixed use. She has also had an active development practice working in all aspects of development, starting with acquisition, and seeing projects through the phases of construction, financing, leasing, management and ultimate sale. 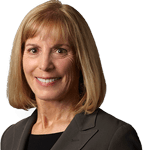 Before joining SSL, Leslie was a director and shareholder of Ellman Burke Hoffman & Johnson, PC. Prior to Ellman Burke, she was a partner in the real estate group at Morrison & Foerster. B.A. – Barnard College, New York, New York (Phi Beta Kappa). Acquisitions & Dispositions; Development & Construction; Public Private Development; Leasing. Represented the developer in developing the project known as Contra Costa Centre, located on property owned by BART surrounding the Pleasant Hill BART Station. Her work included negotiating a disposition and development agreement and long term ground leases for the project. Represented a national developer in acquiring a large parcel near Market and Van Ness, slated for extensive further development by the acquiring developer. Represented the developer of the mixed use project that includes the Four Seasons Hotel and the adjacent retail on Yerba Buena Lane. Represented the developer of The Paramount, a high rise apartment project tat Third and Mission. Represented the San Francisco Museum of Modern Art on its original building on Third Street. Represented a small business in its sale of a large parcel of land to a major developer in the Potrero Hill district of San Francisco. Represented a major insurance company in purchases and sales of various properties around the country. Real Property Section Executive Committee of the Real Property Law Section of the California State Bar Association: Former member and Vice Chair. Golden Gate Chapter of Lambda Alpha International, an honorary land economics society: Past president and current member as well as Chair of the nominating committee for almost 20 years. Northern California Super Lawyer in Real Estate. List of Best Lawyers in America in Real Estate (_____ through 2016). Board of Trustees for the Golden Gate National Parks Conservancy: Former member and vice chair; currently a Board Associate and member of the Projects Committee. Urban Land Institute: Former full member as well as member of the Commercial and Retail Council. Also former member of the Executive Committee of the ULI San Francisco Bay Area District Council. Member of Commercial Real Estate Women – SF (CREW).